How easy it is to pass judgement upon someone. 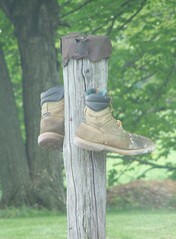 That thought came to mind as I passed those well worn shoes nailed to the post. I continued driving and ended up who-knows-where in Knox Co. but finally ended up backtracking back to snap a photo of the shoes. Why is it easy to judge others? Why should what they do, what they wear, how they worship, how they live ... why should any of it matter? As long as they are content and not commiting murder, they need not be judged. Of course, there are those who would disagree with me on that. There are those who feel it is their responsibility to judge and measure. Morality is a difficult thing. Who sets the yardstick for it? The system of right and wrong, but to whom? I think the old adage to never judge someone until you've walked a mile in his/her shoes is one that should not be ignored or overlooked. I really thought that I had commented on this yesterday, however it doesn't seem to be showing up. In short, I agree with the points you've made here, Cher. It is sad and unfortunate to be part of a society that thrives on judgement - demands it even. It seems that nothing is above reproach, from the style of our close to our choices on morality.